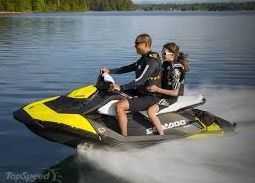 Our Sea-DOO Spark is the best personal watercraft you can rent. It has a 90 horsepower Four stroke engines (super quiet). It seats two and best of all it has brakes! All the fun with none of the worries. Daily jet ski rentals are available at the Wild Eagle Lodge for a day of fun on the Eagle River Chain of Lakes, with direct access to 10 area lakes. 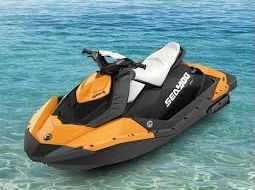 With a jet ski rental of 2 or more days, we will also DELIVER & PICKUP a Sea DOO Waverunner at your dock*! (* Within 50 miles of Eagle River WI) Call 715-406-4700 or Reserve Online TODAY! 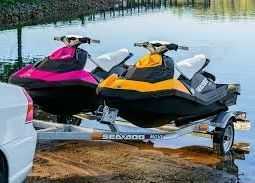 From the afternoon you arrive just walk down to the dock Sea-doo will be waiting gassed up with everything you need. Your Sea-doo, comes with life jackets and a Storage ramp so you don’t have to worry about tying it up overnight. All of the equipment is included at no extra cost. We also make it easier on the worst day of your vacation (the last day) just leave the Sea-doo tied to the dock and we will pick it up after you leave. We will fill the gas tank and then charge your credit card so you don’t have to spend any time on your departure day worrying about the boat. Deposit - we take the full rental amount upon reservation and we will refund 100% up to 2 days before your arrival if you cancel within in 2 days of your arrival there is a $70 cancellation charge. All boats are delivered with a full tank of gas and we will charge your credit card for the gas that you use after we pick up the boat. We fill up the tank and charge you what it cost we don’t add any extra fee. All safety equipment is included with your rental including ski jackets. Everything you will need to enjoy your rental is included from Skis to Dock lines is also included. Our Lakes up here are forgiving Make sure you are at idle speed within 100 feet of the shore, pay attention to the buoys and Markers. Make sure all the kids and adults who can’t swim wear life jackets while on the boat. When pulling Tubers and Skiers turn the engine off when your within 40 feet. We Deliver to Boulder Junction, Conover, Eagle River, Lac du Flambeau, Land O Lakes, Manitowish Waters, Phelps, St. Germain, Sayner, Star Lake, Arbor Vita, Clearwater Lake, Lake Tomahawk, Minocqua, Rhinelander, Sugar Camp, Three Lakes and Woodruff. Service Area: Eagle River, Saint Germain, Three Lakes, Sugar Camp, Phelps, Rhinelander, Land O Lakes, Lac Du Flambeau, Woodruff, Florence, Wakefield, Gleason, Deerbrook, Wabeno and surrounding communities. © 2016 - 2019 Page 1 SEO Design, All rights reserved.